“Seattleites” love our water. The lakes, the ocean … even the rain. Most of us picked Squirtle for our starter Pokémon and that’s probably a fact. 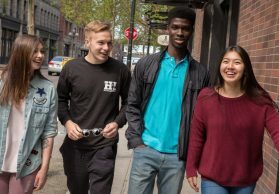 If you’re spending an afternoon in downtown Seattle, the waterfront is just a short walk away — less than 10 minutes from Pike Place Market. 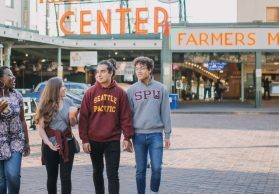 SPU’s Aaron Coe, Alexia Estrada, Ethiopia Ephrem, and Anya Annear recently hit up some of our favorite spots for lunch, dessert, shopping, and one of Seattle’s most Instagrammed attractions. Before Ryan Gosling and Gaga were opening restaurants, the OG celebrity restaurateur was Ivar Haglund, a local musician who founded Ivar’s Fish Bar in 1938. 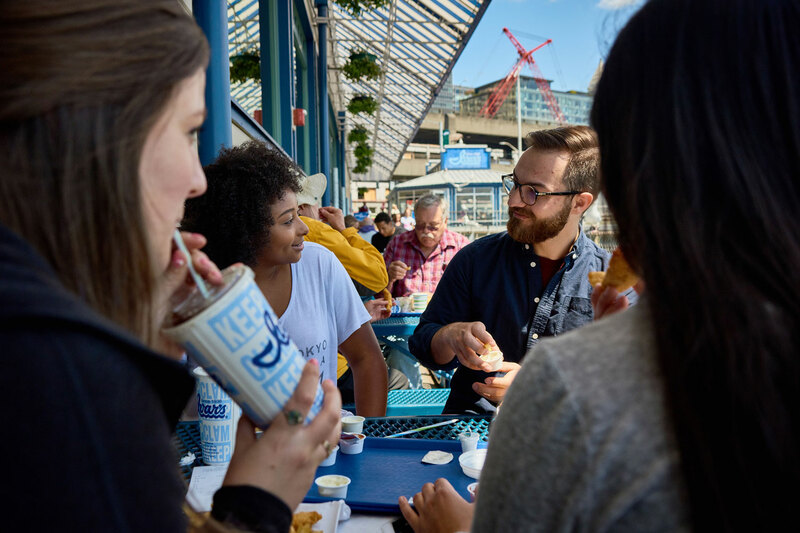 Now, there’s nothing more Seattle than eating fish and chips at Ivar’s on the pier. 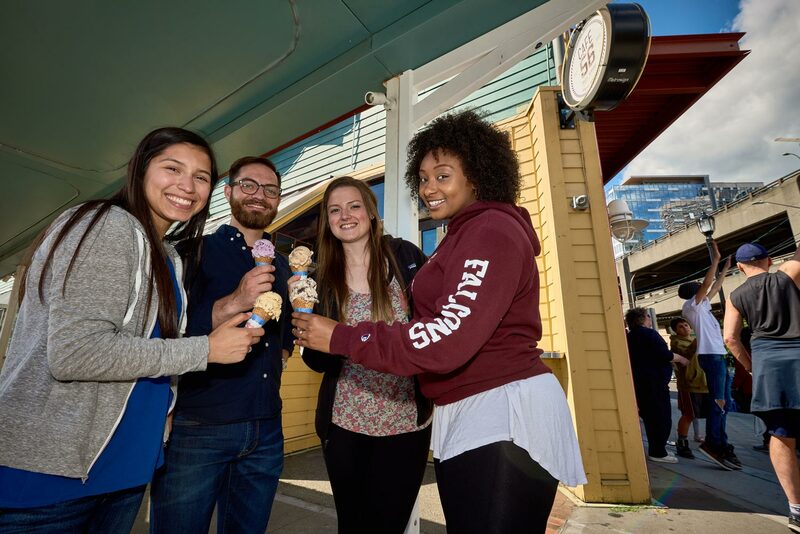 Ivar’s keeps it simple: the walk-up counter serves only a few seafood dishes, homemade clam chowder, and chips … also known as “fries,” thanks very much. Grab a seat at one of many picnic tables that overlook the water, with views across the bay and to the islands. 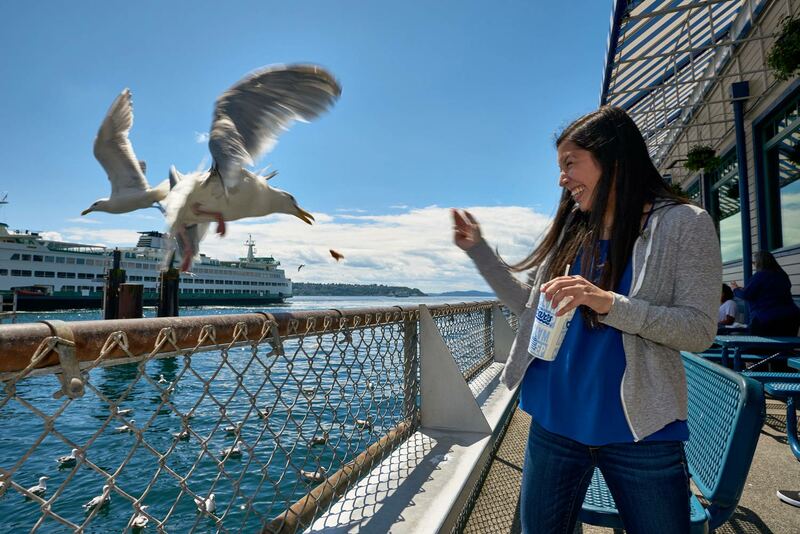 Seagulls may take a shot at your chips — no, fries — but that’s part of the fun, right? 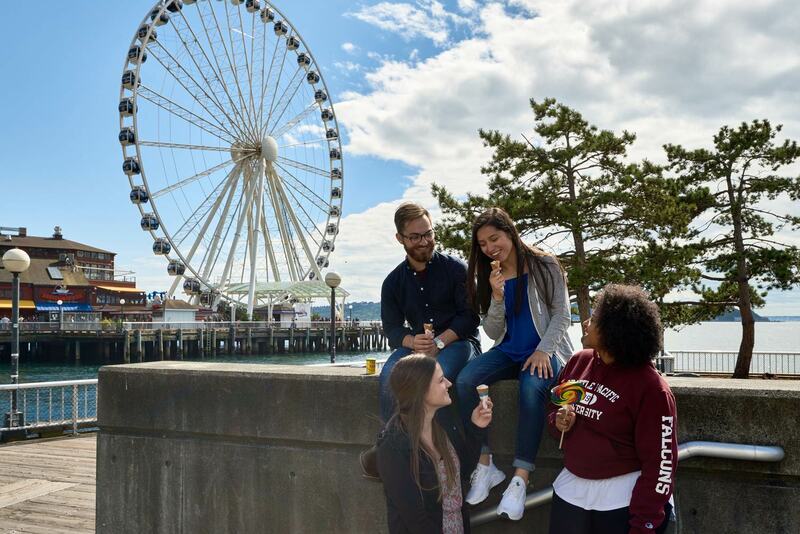 From the pier, you’ll already have an incredible view of Puget Sound but Seattle’s Great Wheel (literally) takes it to the next level. 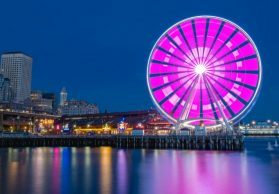 The 175-foot ferris wheel is the largest on the West Coast and the only one built over water! Bring your friends: Each compartment seats eight people. 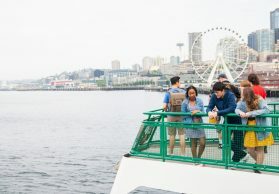 A 12-minute ride on the Great Wheel gives a totally unique perspective of the city, including the Space Needle and even Mount Rainier. 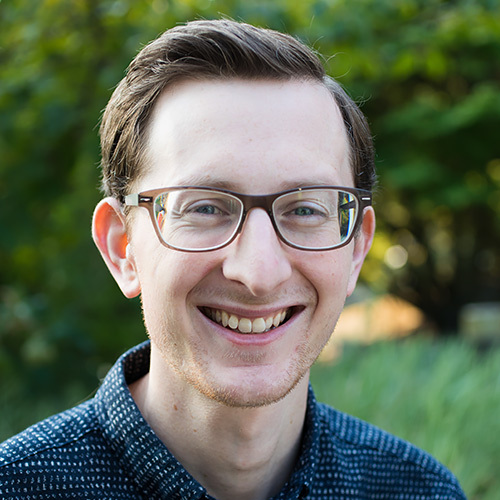 Afterwards, get that perfect shot with pro tips from SPU student photographer Chris Yang. BONUS: Ever been on Soarin’ Over California? We have our own version of the iconic Disney ride here in the Pacific Northwest! Wings Over Washington is located right next to the Great Wheel. For $17, you’ll get a totally immersive tour of Snoqualmie Falls, the San Juan Islands, and other famous Washington landmarks. Everyone’s hometown has a store like this, which sells everything you want and absolutely nothing you need. This is ours. 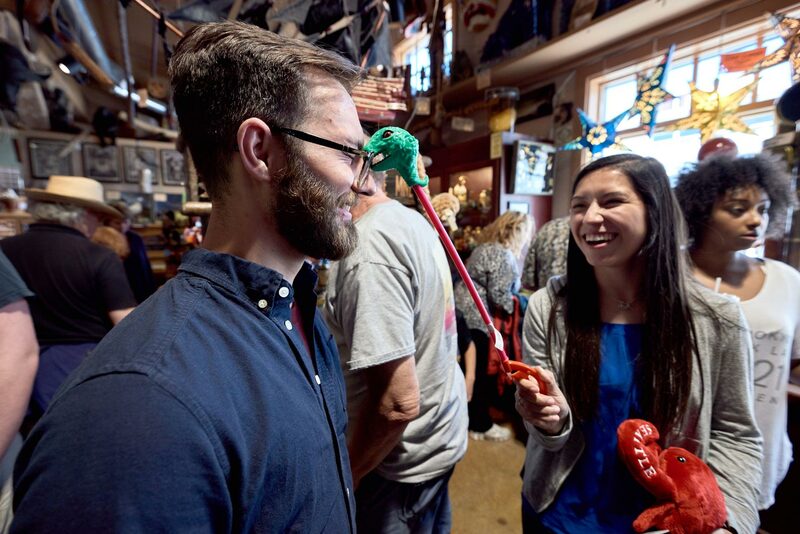 Let your curiosity get the best of ye at Ye Olde Curiosity Shop. Does anything top off a day on the water better than ice cream? Nope, and Seattle has no fewer than three scoop shops on its waterfront. Café 56 is one of our favorites and will quickly become yours, too. Try huckleberry, a classic Northwest ice cream flavor, or cookies-and-cream. Pier 56 (the shop’s namesake) has even more outdoor tables, so take a seat and look back on a great day. You conquered the waterfront.